Fingerprints have formed on your baby’s tiny fingertips, her veins and organs are clearly visible through her still-thin skin, and her body is starting to catch up with her head — which makes up just a third of her body size now. If you’re having a girl, she now has more than 2 million eggs in her ovaries. Your baby is almost 3 inches long (the size of a medium shrimp) and weighs nearly an ounce. 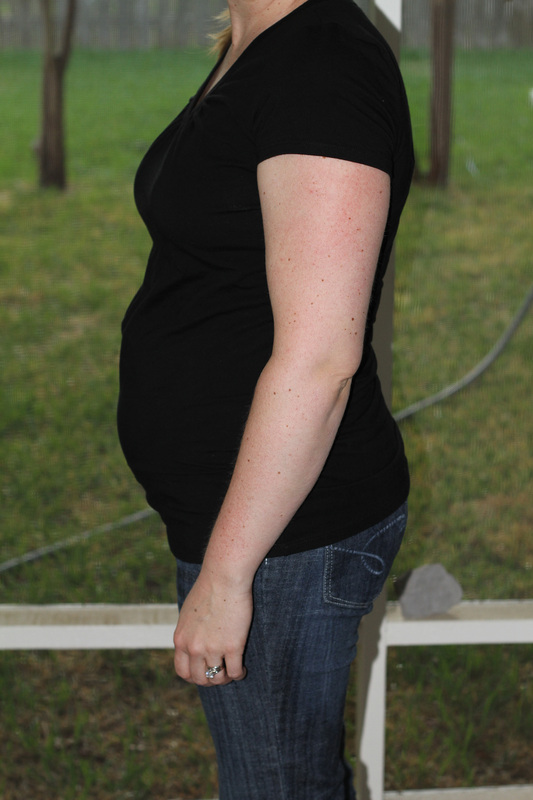 Due Date: November 4, 2011 – 189 days to go! Weight Gain: About a pound. 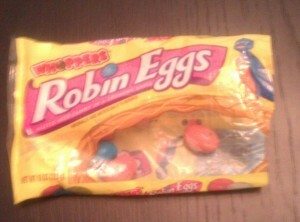 Stupid Easter candy. Symptoms: I think I have have had my very first smell aversion. I was washing dishes yesterday morning, and SOMEthing in the sink smelled so gross it kept making my gag reflex kick in, so mostly I washed dishes with my head turned to the side while breathing through my mouth. Cravings/Aversions: Still no specific cravings, but I go through phases where nothing really sounds good, and while I am eating something, I get bored of it really quickly. Sleep: Still good, but more nighttime bathroom breaks now. I miss: Nothing specific this week. I’m content. Exercise: Yes! I tried out the new bike and it’s great! I did a 20 minute workout the other night to break it in. I think I might do another one tonight. Diet: Lacking this week…Too much Easter candy – not enough veggies. Speaking of not hiding things; yesterday the Great Facebook Announcement was made, which means that now the news is officially ‘out’ (except for my work). Only 2 people at work have been told, but I think for everyone else, I’ll just let nature do its thing, and they’ll eventually figure it out on their own. Most of my co-workers (and boss!) are in another state or overseas, so I can get away with not telling them for as long as I’d like, until the rumor mill starts, that is, which is always a possibility. 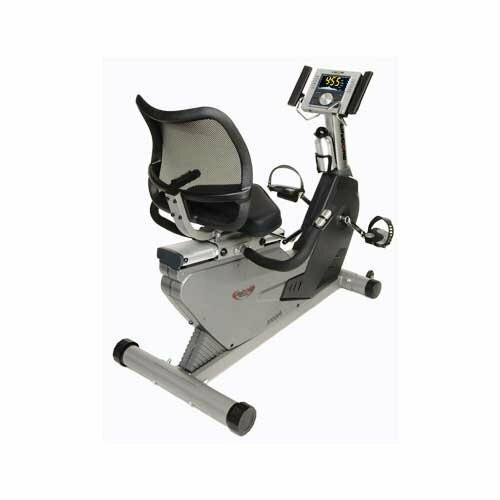 In other news, Scott found a really great Craigslist deal on a recumbent bike that we snagged last night! by jhking in Uncategorized Tags: Domestic Bliss, Holidays! We had a lovely Easter weekend at home. The weather was fantastic, which resulted in plenty of reading time for me out on the back porch with Madison, and one less than exciting trip to the dump to take all of our cardboard recycling. We had some cinnamon rolls, some chocolate chip cookies and of course, Easter baskets. 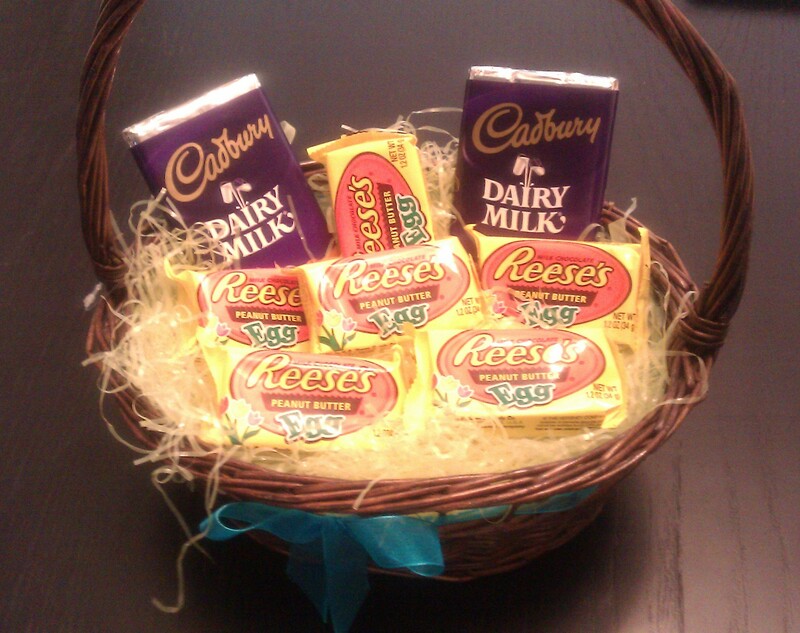 And, since I am in charge of Easter Baskets, I may have allowed myself to sample some of my loot prior to the big unveiling. I case you are interested, I’ve documented the bounty. Candy bars courtesy of Karen! 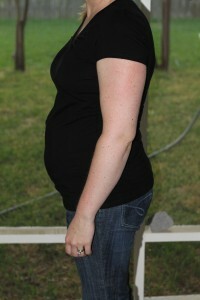 Due Date: November 4, 2011 – 196 days to go! Weight Gain: As of this morning, no pounds gained so far. Symptoms: None, really, other than oily skin and not being able to eat very much in one sitting. Cravings/Aversions: I’ll eat anything I normally would – In small amounts, that is! Sleep: Yes, please. Bedtime seems to be coming earlier and earlier. I am loving: How great I feel! I miss: I’m surprised at how much I do miss drinking a beer or mixed drink when people around me are having one. Now that it’s getting hot outside, it sounds so good! It’s a: I think boy. Diet: Pretty good…fruit is about my favorite thing right now, so I’m taking in a lot of that. Well, thankfully my family’s fertility is no joke. The history seems to be, if you are a female in my family, you’re going to get pregnant, whether you really mean to….or not. HA! We got lucky on only our second month of trying. 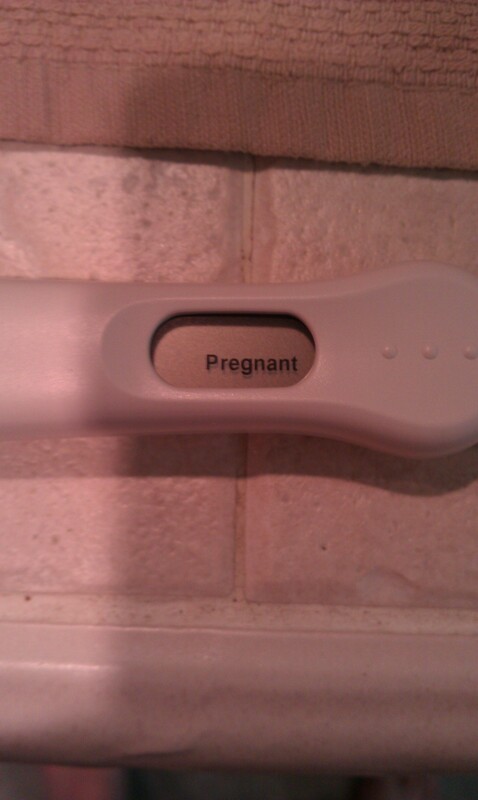 Scott said he really felt like I was going to get pregnant the first month, but I didn’t think so. And I wasn’t. And then he said he totally didn’t think I was going to get pregnant the second month. I didn’t think so either. (pessimism, what?) Things were gong along just like normal (read: not pregnant) and I suddenly got sick. Real sick, like it started with a fever, and morphed into coughing and a runny nose, and by the end it felt like razors when I would swallow, and my ears were aching. Just general misery. It was negative, so I took myself immediately to get relief from the pharmacy, and also a pint of ice cream. (The Dr. suggested it for my throat!) The next day I already felt tons better, and was looking forward to the fact that Monday was a work holiday and I got to stay home anyhow. Well, Monday came and I noticed that my skin was doing this weird thing…it was….NOT breaking out. And my period was only supposed to be about 4 days away, so that was unusual. 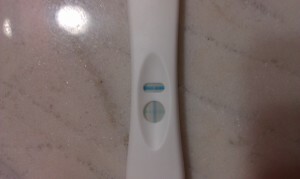 I had a couple of cheap pregnancy tests in the bathroom, and I figured, why not? So I took one…and while I waited for the result, I got ready to go pick up Madison from the vet, where she had just had her teeth cleaned. And I went back to look, there was a definite plus sign! So here it is! Now you all can follow along at home. It’ll be just like being here in person, I swear! I’m still figuring out what I’m doing and how to get everything all set up on this here blog, so if you come to check for a post and things look weird…well, that means I’m hard at work to make it better. I’ve also decided that I will record how far along I am at the bottom of each post, so when I want to go back and re-read things, I’ll be able to pinpoint it exactly. You’ll notice up at the top, that so far, I’ve got 2 pages – the front page and probably the more popular page – the one with all the belly pics! 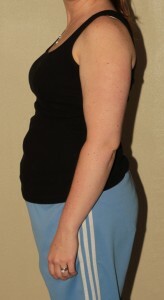 I’ll keep adding to the belly pic page each week with a new picture for your viewing pleasure.